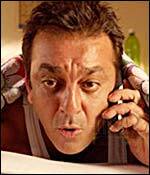 If a lyricist was told to recreate Munnabhai MBBS magic in its sequel Lage Raho Munnabhai, what would be his reaction? "Nervous breakdown," replies lyricist Swanand Kirkire, with a smile. "I was very scared but (producer) Vidhu Vinod Chopra and (director) Rajkumar Hirani had faith in me." A month after the release of Lage Raho -- a huge blockbuster -- Swanand feels elated that he managed to meet everyone's expectations, especially since the Mumbai Hindi used in the songs sounded perfect. For Swanand, 36, life has seen all kinds of ups and down. He started as a theatre director, went on to become a television serial writer, then a chief assistant director, dialogue writer, singer and now, lyricist. After graduating in commerce from Indore, Swanand always felt films were where his interest lay. His father Chintamani and mother Neelambari were classical singers but he never showed interest in singing. He had a chance meeting with actor Ashish Vidyarthi in Indore during his college days in 1993. 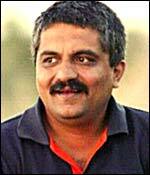 Vidyarthi encouraged his dreams, and so, he went to Delhi and joined the reputed National School of Drama. "Since then, I have always wanted to be a director," Swanand laughs. "Even today. But I ended up singing, penning lyrics, dialogues and became popular." The first tryst came with direction was when Swanand wrote and directed a play on freedom fighter Bhagat Singh in New Delhi. During his theatre days, he learnt that Manju Singh, a television serial producer, was looking for a writer for his serial Swaraj, also on Bhagat Singh. The next thing he knew was that he was on a flight to Mumbai, and had a plush apartment in Warden Road. Swanand thought life would be a bed of roses. But when the serial ended, Swanand was thrown into a life of struggle. He had to give up his apartment and settle down in Goregaon, a Mumbai suburb. Talking about those struggling days, Swanand says, "Mumbai is a very fair city. It is the city of dreams for every outsider. If one has talent, he is welcome to this city. But it takes time." A friend introduced him to filmmaker Pankaj Parashar, who in turn, introduced him to director Sudhir Mishra. Mishra was doing a serial called Talash, with his assistant Ruchi Narain. "I was very happy to be working with Sudhir Mishra because I loved his earlier work. He told me to assist him while he was making Calcutta Mail, Chameli and then Hazaron Khwaishen Aisi," recalls Swanand. It was in the shooting of Hazaron where he was asked to arrange a song for the film, with a mix of classical and north Indian tunes. He wrote the beautiful Bawara man dekhne chala ek sapna, whose music was composed by Shantanu Moitra (who later went on make music for Parineeta and Lage Raho Munnabhai). Shantanu introduced Swanand to director Pradeep Sarkar, and Swanand was inducted into the Vidhu Vinod Chopra production house. So how does he write lyrics considering he has no literary background? "I draw inspiration from life rather than books," Swanand explains. "I am not a born poet. My writing comes from observing people." 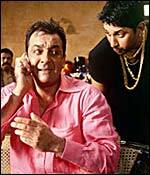 "Like, see the words Bole toh bole, kaisi hogi hai; and Khopdi ke khopche mein khalbali machae (in Lage Raho Munnabhai). This is Mumbai slang and I learnt it on local buses and trains. The Mumbai language is complete bhelpuri and there is so much to learn." But he says he has read the works of poets like Majrooh Sultanpuri, Faiz Ahmed Faiz, Bhawani Prasad Mishra, Nirala, Gulzar and Javed Akhtar. Next, Swanand will pen the dialogues for Chopra's Eklavya, starring Amitabh Bachchan, Sanjay Dutt, Saif Ali Khan and Vidya Balan. He will also write the lyrics for Pradeep Sarkar's next film with Yash Raj Films, and the script of Sudhir Mishra's next, starring Shiney Ahuja and Soha Ali Khan. He is also busy with advertisement jingles. Film should be like this.At Least Yearly once they should direct such type of films. Sub: LAGE RAHO SWANAND !!!! !